Who is this player? invites you to train your soccer skills and game up against other soccer fanatics to see who recognises the most soccer players! Will you be able to tell Ronaldo and Messi apart? We have collected all the pro's and will show you their pictures, try guessing them out of three names and challenge yourself to get the best high score! The best thing about Who is this player? You will have two lifelines to help you get there, but use them wisely! This will remove one answer, leaving you with a 50:50 chance to guess the soccer player and continue playing to beat your high score. This will show you exactly what soccer fans all over the world would guess, but are they to be trusted? You will just have to find out for yourself! Save your high score by logging into Facebook and invite your friends to battle you for the best high score! 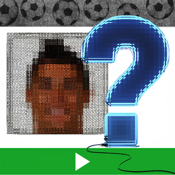 Collect national badges for each first player guessed from a new country and see which players you know best!